Sage Veda Vyasa has prescribed that devotion to God (Bhakti) is the essence of all Hindu scriptures and applicable at all times for us to follow. What is ‘Bhakthi’? This is a loose translation of the english word devotion. In present modern times, all of us devote our time and mental faculties to our work, families, friends, hobbies and more work. However let us consider ‘Bhakthi’ as our particular devotion towards the thoughts of God. Keeping our minds in control using His thoughts as the anchor of all our activities and His feet as the destination of all our thoughts, could be one way to interpret ‘Bhakthi’. 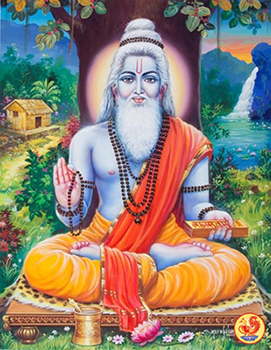 For the benefit of all mankind, Sage Vyasa has categorized and spread the essence of Vedas as four divisions namely Rig Veda, Yajur Veda, Sama Veda and ‘Atharvana Veda’. He has compiled the core kernel meanings of the Vedas, namely the ‘Upanishads’, as ‘Brahma Sutras’. Further more He has given us the ‘Mahabharata’, one of the two great epics, popularly known as the fifth Veda and the eighteen Puranas. These scriptures are the guiding lights of spiritualism and humanity in Hinduism to this date and meant forever, for the benefit of all life on earth. It is He, the Sage Vyasa, who is considered as an Guru incarnation of the Lord Himself, has prescribed that devotion to God – ‘Bhakthi’ – is the most basic essence being taught in all scriptures. In Hindu scriptures and teachings, there is a special name that is given to present modern times. This is known as the ‘Kali Yuga’ – Yuga meaning a period of time. This is a great season and time , according to Sage Vyasa, to undertake our efforts in sowing and reaping the seeds of Bhakthi. Why? According to Sage Vyasa, Bhakthi is the easiest means to see and reach God; and the only ‘code of time’ that is both easy and achievable means for mankind to undertake for our inner journey, in this Kali Yuga. Bhakthi is both the path and means for us to counteract the ill effects of derogating value system in any society. How? What is the best means to understand the basics and nuances of this path? This sixteen worded mantra is prescribed by the great Sage Narada, in a scripture called ‘Kali Santharana Upanishad”. According to this sages’ first hand wisdom of God, chanting His divine name with this divine mantra is the easiest of all means to establish our direct connection with God, live our lives and realize Him happily.